Successfully Added Green Laser Pointer and Executive Writing Pen to your Shopping Cart. Unique Green laser pointer + real executive style writing pen in one tool. This two-in-one function dynamic laser "gadget" is a must have item for anyone that needs a bright laser pointer as well as everyday ink pen. 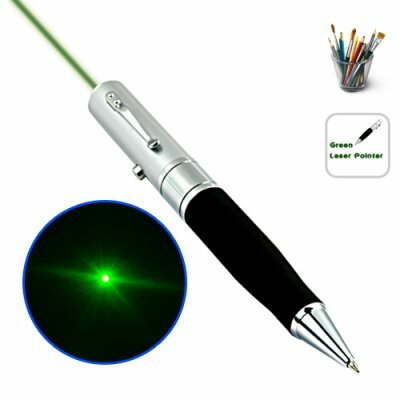 Designed with the multi-tasking office worker, IT professional and teachers in mind, this Green Laser Pointer and Executive Writing Pen allows you to carry around the daily writing pen for your everyday writing needs along with a convenient laser pointer that you can take out of your pocket and use anytime the need arises. The pen both looks and feels professional and would suit any venue from a lecture theater to a boardroom. If your goal is to deliver the perfect presentation and capture the attention of the audience with pinpoint visual slide highlighting or just to write a friendly economics memo for Obama to review, this professional Green Laser Pointer and Executive Writing Pen effortlessly lets you do these things from one convenient gadget. Whether you just want to impress friends with the latest "Laser Gadget" or you are a multi-tasking professional, the CVGF-G171 Green Laser Pointer and Executive Writing Pen has got all your writing and laser needs covered. It's in stock right now for single piece or bulk stock orders, so order yours today and we will express ship it out to you tomorrow! This product comes with a trial ink cartridge. It will work for a short time and will then need to be replaced with a standard ink cartridge found in any local stationary store. This laser pointer pen is perfect for things such as lectures, seminars, project screens, charts, slides, facility tours and building inspections. With a bright (green) colored laser with exceptional clarity, this pointer is the ideal tool for highlighting information and pinpointing important areas. Compact and convenient, you can easily take this pen with you anywhere you like. The ideal pen to create some excitement at your next event, the CVGF-G171 is sure to become the center of attention everywhere you go! Important Note: Laser products are restricted to official government use only in some countries. You are solely responsible for finding out whether this product is legal to import and/or use this product in your country. We will send you the products you order and cannot accept any liability for customs issues or any implications of your ownership or usage of this device. The laser is strong enough to reach across any size classroom, office or warehouse. Can the laser really reach 1000 meters? Yes it can. The best test of this would be to do a multi-day climb up a mountain and point down to a clearing below to see if you can see the beam (if it is less than 1000 meters, then you will! ).